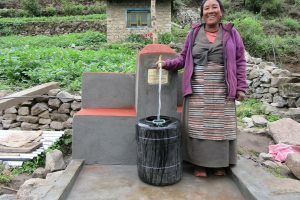 A gravity-fed water system was constructed in the village of Lahachhewar in the district of Ramechhap in Nepal, from March to June 2016. 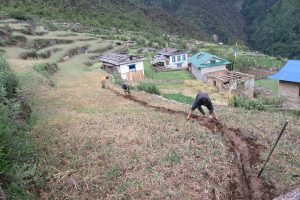 The work was done by the residents of the village (on their own time), with technical support and guidance from Tamakoshi Sewa Samiti (TSS, a Nepali NGO based in Ramechhap). 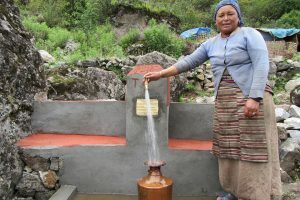 Funding was provided by World Neighbours Canada, which was supported by Global Affairs Canada, Kamloops West Rotary, Aldergrove Rotary and Oliver Rotary.World Neighbours Canada also continues to receive donations in Rachel Denbigh’s name for work in Nepal.This was the first water system installed under a new four-year project supported by Global Affairs Canada. The Lahachhewar Water System will service 30 households with a population of 206 people – 120 female, 86 male, 81 children under 12. 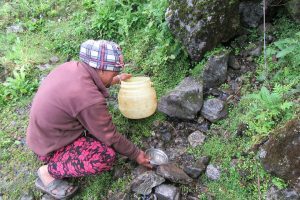 The water system consists of an intake at the source (a spring on the hillside, a concrete and stone storage tank below the source, a buried PVC water line running down the slope to the village, and 6 public tap stands. The construction of gravity fed water systems requires that reservoirs be built at some point between the water source being accessed, and the water stand pipes in the villages being serviced. The reservoirs are typically 5 cubic metres in size, and will hold 5000 litres of water. The reservoirs are always built in a location such that a break would not cause a flooding of any nearby residences. 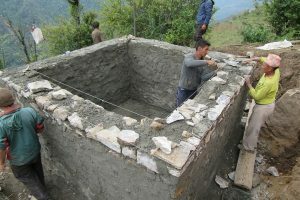 In the 27 years, including 2015 when there was a major earthquake in Ramechhap and nearly 90% of the homes in the district were damaged, a TSS built water reservoir has never failed. Only minor damage was sustained to a few water systems in the 2015 earthquake. The Water User Committee, with help from the TSS technical people, plan all aspects of the water system. They decide the location of the intake, the route of the pipe, the size and location of the water reservoir, and the location of the tap stands in the village. 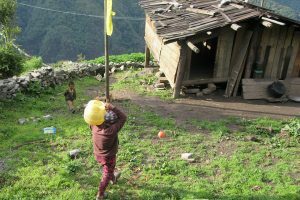 The water users – the villagers – do all of the physical work. They transport materials, they dig and backfill the ditch for the pipe, they help build the water reservoir, they help construct the tap stands. This is all done with guidance of the TSS technicians. The cement work is done by people trained by TSS over the years. 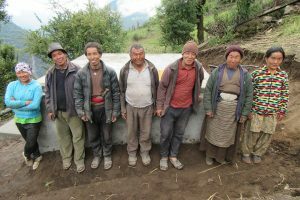 These people may still live in their original village, but will travel to nearby locations to do the cement work and to train others to do similar work. The Government Engineer is notified when the work is done and will do a final inspection. At all stages of the project, environmental considerations are identified and assessed. The water source is always fenced off so that animals cannot access the source. Ditches are always filled in such that there is no evidence of ground disturbance. Reservoirs are always placed in areas such that if they were to fail, there would not be any damage to structures below them. Tap stands are always made of cement, with cement catchment areas below to prevent erosion of the immediate area. The farthest tap stand from the water source is approximately 2 kilometres. It is estimated that the women using that tap stand will save 3-4 hours per day in carrying time. 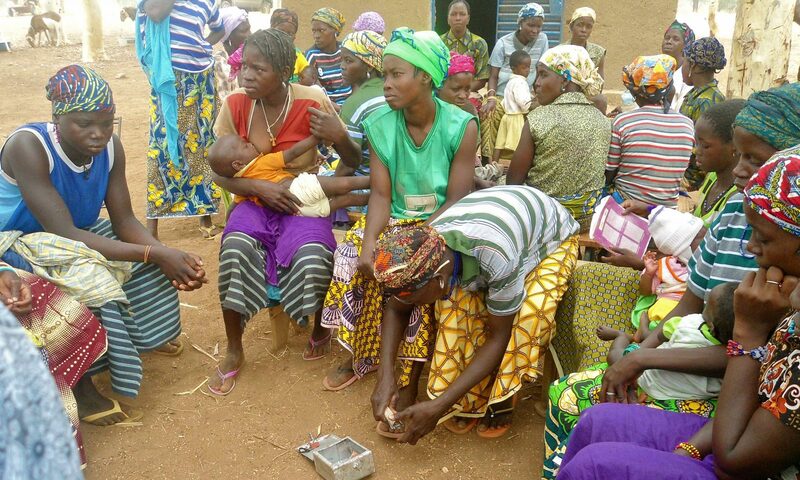 What an important change the completion of this water system must make in the lives of these women!